Weaver Aircraft Co was formed by George "Buck" Weaver, Elwood “Sam” Junkin, Clayton “Clayt” Bruckner and Charles “Charlie” William Meyers at Loraine, Ohio, in 1919. Waco built Cootie parasol-wing aircraft. Bruckner and Junkin actually began designing aircraft in 1919 with a flawed plan for a floating airplane that never flew. Meyers, too, had already designed an aircraft with Weaver and the pair approached Bruckner and Junkin, asking them to join their construction efforts on a single-seat monoplane named the “Cootie.” Unfortunately, Weaver crash-landed the Cootie during its first flight attempt and suffered extensive injuries in the crash. The WACO partners persevered, designing a practical three-seat biplane, the WACO 4, and building it out of parts left over from the Cootie and other biplane efforts. The team continued to assemble airplanes from parts salvaged from surplus World War I Curtiss Jennys, continuously tinkering with their designs and making improvements. Eventually, they sold two WACO 5 biplanes. From Medina, Ohio, in 1921, reorganized as Advance Aircraft Company in 1923 at Troy, Ohio, although the aircraft retained the WACO designation. The first Troy-built model, the WACO 6, was soon being marketed. 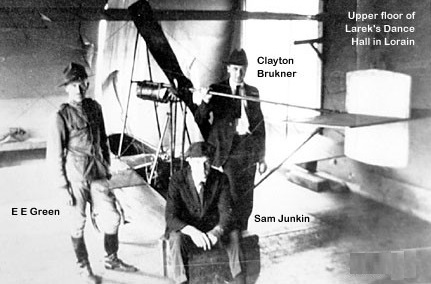 Following Buck Weaver's death in 1924, Clayton Bruckner and Sam Junkin reorganized the business and soon introduced the company's popular Model 9 (or Nine) in 1925. Became Waco Aircraft Co in 1929, based in Troy, Ohio, USA. First really successful venture was three-seat Model 9 of 1924. Developed long and successful line of cabin biplanes, sporting, racing, and military airplanes. The Waco series of four-seat cabin biplanes were initiated in 1931 and were produced continuously in progressively refined models until 1939.WACO continued to refine the aircraft design and accessories on an annual basis, but retained the basic configuration to maintain quality and avoid the high costs of wholesale redesign; as a result, selling prices remained stable and affordable. By 1936 was largest constructor of commercial aircraft in USA. Production of WACO civil aircraft was suspended in 1942 after U.S. entry into World War II. The company contributed to the war effort by building assemblies for a variety of military aircraft and manufactured the well-known CG4-A troop-carrying gliders. After war developed a new monoplane, the Aristocraft (see O'Neill), but abandoned it in 1947. Company went out of business. Waco production ceased and the company went into contract manufacturing. Between 1919 and 1947, the company produced sixty-two different aircraft models and led all its competitors in number of aircraft registered. In 1963 it became Waco Division of Allied Aero Industries (Franklin and Jacobs motors, Omega helicopters). In 1969 rights sold to SIAI-Marchetti (Italy) for production of new Waco Meteor, Minerva, Sirius, Vega, and Vela. Early Waco designs were given numbers to designate types but later models gained letter designations. The first letter denoted which engine was used, the second gave the wing design and the third the airframe model. From 1934, the first letter still gave the engine make and horsepower, the second gave the design and the third, the series.